Trying to Pay It All Off... Before Graduation? So... I Should Start a Blog to Pay Off My Debt? When I was a junior during the spring of 2012, I added a giant, audacious, redonkulous goal to my Impossible List: I wanted to pay off all of my student debt – nearly $15,000 – before graduating. In October of 2012, I made my first payment, kicking off my debt-obliteration journey. And on March 13, 2013 – just six months after I started – my final payment to Sallie Mae cleared. I’m now completely debt-free, and I’m still in college. In this post, I’m going to tell you my story, including exactly how I paid off my debt. Afterward, I’ll provide some additional strategies you can use to minimize your own debt and start paying it off today. The average college student graduates with around $27,000 in student loan debt today. I shouldn’t have been one of those average students. I should have been an outlier from the beginning, taking on no debt at all. My parents told me – well before I graduated high school – that I was pretty much on my own for college. They simply didn’t have the money to pay for it (though they did help me with some personal expenses, like car insurance and my phone bill, which I am very grateful for). So I spent my last two years of high school applying for tons of scholarships. It paid off. By the time I entered Iowa State for my first year, I had won enough scholarships to pay for all of my tuition, plus a few extra bucks for books and fees. I also managed to land a part-time job at the campus tech support center before even starting classes, so I had a weekly income to look forward to. And yet, I still ended up in debt. Why? It’s all in the room and board. You see, I was of the opinion that I needed to live on-campus for the first couple of years. I also didn’t do enough due diligence, so I thought my only option was to pay for the whole shebang right up front. My FAFSA results had offered me around $7,200 to pay for room and board through Stafford loans, so I said, “What the heck!” and took them. And I did the same thing sophomore year. I moved back into my old dorm, and took another $7,200 loan. In hindsight, I can see that I should have just asked to pay for my dorm in monthly installments (yes, this typically is an option). I was making enough money to do so, since I worked 20 hours a week at the campus tech support center. This is where a ton of the money I could have used to pay for my dorm up front ended up going. There was no reason not to do so – except I just didn’t think about it. I made the typical mistake of piling problems upon my future self, and proceeded to spend all my job money on my computer setup and other random crap. As I said in the section above, I did the typical thing college kids do – I heaped all my problems on my future self. Of course it’ll be easy to pay off my debt after graduation, I thought. I’ll be making gobs of money. See that line near the bottom that says Total Interest Paid? Yeah, that’s over $4,000 I’d have to pay on top of the money I borrowed. Four grand I’d have to pay to get absolutely nothing in return. Now, even under my original plan, I probably would’ve paid more than the minimum $50/month payment. Still, I didn’t want to have to pay any amount of interest. That just seemed to me like throwing my money down the toilet, and it was unacceptable. So, I decided to get a bit audacious. I decided to set myself a crazy deadline. Trying to Pay It All Off… Before Graduation? During my junior year, I decided to try the impossible – paying off all my debt before I even graduated. I basically wanted to graduate without anything hindering me, and I saw my debt as the biggest and most annoying hindrance. Even though my debt balance was near $15k, I thought it was doable. I had around $6,000 saved from the summer internship I did with Principal, and I was also an RA for the first semester of junior year, which kept me from having to pay for room and board. So I figured I had a good chance of pulling this off. I just had to figure out how to make some more money. Here’s where the coding skills I had been teaching myself since high school came in handy. A few of my connections ended up needing websites built, so I jumped at the chance. I ended up contracting about $3,000 of work for myself during the spring semester of my junior year. Things were looking up. Then I got off track. That February, one of my friends posted on Facebook that he was going to Japan during the summer and wanted to know if anyone wanted to come along. I got a little – ok, a LOT – sidetracked in Japan. Now, to be totally honest, my trip to Japan was amazing. It was one of the coolest experiences of my life, and I don’t regret it at all. Check out this post if you’re curious about how it went, or about Japan in general. However, the downside was that I drained pretty much all of my savings during that summer, though that trip and a few other things. I was pretty much back to square one. The Japan trip was an excuse to once again put my burdens on my future self. I rationalized that the trip was an opportunity that wouldn’t come again, and that my debt would always be there for me to take care of later. After the summer was over and I no longer had my huge savings account balance, I got a bit discouraged. Senior year had started, and I couldn’t honestly see how I was going to make close to $15,000 in one school year. I briefly thought of removing the goal from my Impossible List – though I couldn’t bring myself to do it. I was also pretty burned out from freelancing, and didn’t know what my plans were for graduation. I was kind of in a slump, to be honest. But then, something awesome happened. Ironically, my “big breakthrough” wasn’t something that just popped up in front of my nose. In fact, the thing that ended up helping me succeed was the very thing I’d been doing for most of college. In the end, the thing that got me out of debt was the thing I’d been dreaming about for over a year – but thought was impossible. I was able to turn College Info Geek into my job. When I started this site back in 2010, I had no thoughts of making money from it. In fact, I didn’t even know that was possible. I started it because I just wanted to write about the things I was doing to succeed in college. I also figured it would look awesome on my resume, since it would be something I didn’t do in class and built on my own. That’s exactly how things went for almost two years. College Info Geek steadily grew, and a lot of awesome things happened while I was dutifully working on it – my writing improved drastically, I got to travel for free, and I met a lot of awesome new friends. But I certainly wasn’t making an income. Affiliate marketing is the process of promoting the products and services of someone else, and getting a commission when you lead someone to buy from them. So, instead of selling your own product or service, you help someone else promote theirs and get a cut. Now (I don’t know if this actually happens), imagine if the restaurant paid Dan and Bonny $20 every time somebody said they heard about the restaurant through their radio show. That’s affiliate marketing. On the internet, it’s done through links. If you’re an affiliate for a product or service, then you’ll have a unique link to the website where it can be bought. If someone clicks your link and completes a transaction, the business owner knows it came from you because of your unique link – and then you get part of the sale. He only recommends products that he has direct experience with. He never tells anyone to buy anything – he only recommends things. I also noticed that he’s very up-front about his affiliate relationships. He always tells you right in the post if he’ll make any money though a link he posted. That was the main reason his site stuck out to me. I’ve seen a lot of other sites that try to hide the fact that they do affiliate marketing – they basically try to trick people into buying things without letting them know that they have a vested interest in promoting those things. I actually got to meet Pat when I went to Blogworld NYC last summer! Unlike those guys, Pat is always very clear – in fact, he posts a complete report of every dollar he makes online every month. For that reason, I became a fan of his blog pretty much right away. However, I didn’t really know how to apply his strategy to my own blog. Most of my content is about study strategies, internships, and other college topics. The productivity tools I talk about are mostly free as well. So, as I said above, I basically went a year dreaming of turning this blog into my job. I knew there were methods to do it – but I didn’t think they would be possible for me. Then, about a year ago, I realized that HostGator – the company that I host all of my websites through – has their own affiliate program. In March of 2012, I had written a post called The Ultimate Guide to Building a Personal Website – and that’s when it clicked. I had already recommended HostGator in that post – now I could just become an affiliate and hopefully make some money from the work I had already done. I set myself up just like Pat did – I inserted my affiliate link into my website building guide, and I made sure to say right up-front that I’d make money from it. I added a disclaimer paragraph right after the introduction section of the guide. I made sure to let readers know that I recommended a certain hosting provider, that my recommendation was based on my own positive experience, and that it certainly wasn’t the only option. I stated right up-front that I make money through my links to it, and I even put the whole thing in blue to make it stand out. At first, I was actually a bit scared. I was worried that people would see the message and think that I’d somehow sold out. That I didn’t care about anything but money anymore. All sorts of irrational fears were floating around in my head. However, I wanted to be clear and honest, just like Pat was. I respected him immensely for the way he ran his business, and I certainly wasn’t about to be less clear about mine just because I was afraid of being called a sell-out. Luckily, nobody ever called me a sell-out. People didn’t care at all that I was making money from the guide. In fact, there have been more than a few people who have contacted me personally after reading the guide to ask if I got a commission from their purchase. They wanted me to make money. That’s when I really, truly realized the obvious: If you’re creating value and helping people, they don’t care if you make money from it. So, at this point, I’m earning what amounts to a full-time income from College Info Geek. I don’t have to worry about getting a job. And the best part? Since my website guide isn’t going anywhere – since new people can find it every day – I don’t have to constantly worry about getting sales. Which means I can focus on creating other content. Oh, and before I move on, I just need to give a HUGE GIANT THANK-YOU to Pat Flynn for showing me how to make this all possible. Also, another HUGE GIANT THANK-YOU goes out to every College Info Geek fan and reader out there. Without your support and feedback, none of this is possible. I truly hope you’ve found this site helpful (and that it continues to be), and I’m so thankful for all of you. So… I Should Start a Blog to Pay Off My Debt? …maybe. Probably not. Keep reading. I’m not trying to say that this method will work for everyone. That’s not the point. The point is that it worked at all. I would have never thought in a million years that the way I’d pay off my debt was by building a profitable blog. When I started College Info Geek, I had no intention of making money; in fact, I thought it was impossible. I looked at the superstar bloggers at the time – Darren Rowse, Michael Dunlop, and Alex Mangini (who was only 16 when he sold his first blog for $20,000) – and thought there was no way to get to their level. And yet, here I am. After almost three years of working incredibly hard, focusing on constantly improving, and getting help from dozens of amazing people, I was able to pay off my debt. With a blog. What does this mean for you? Does it mean you should start a blog to try and pay off your debt? Probably not, though I really do think you should start a blog (and here are 14 compelling reasons to do so). What it does mean is that there are other methods out there for making money than just getting a job and trading hours for dollars (or a salary). You can take side jobs to make extra, or start an entrepreneurial project. The path might not be clear to you right now (as you’ve seen, it took me almost two years to find mine), but if you want it bad enough, you’ll find it. Now that you know my story, I’d like to share a few other strategies you can start implementing today in order to pay off your debt! Get a Job Now. I worked around 30 hours a week during my last two years of high school. Had I actually saved that money, I could’ve graduated with over $20,000 in savings. Ask your parents to cut small expenses and stash the savings. Skipping their $4 latte every day results in $1,460 per year saved. Go to college at a public, in-state school. In addition to having more opportunities (bigger school, more classes, majors, clubs), you’ll also pay only a fraction of the cost of private or out-of-state school. It may not be your dream, but after four years, you’ll be debt-free and have even bigger dreams within your grasp. Trust me, a prestigious private school will not magically make you more money. That’s a factor of your own effort. Caveat: If you’re able to secure enough non-debt financial aid to make a private school cheaper, by all means go for it. However, don’t let yourself become attached to a more expensive school before you know how much it’ll cost you. Seriously, a public, in-state university is a great choice. I wouldn’t trade my experience for the world. Get a part-time job on campus. 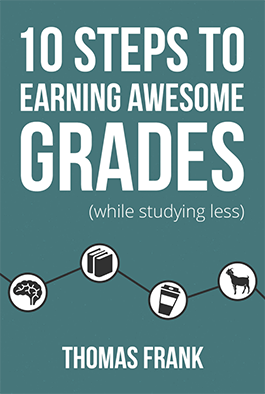 Regardless of your class load, you’ve probably got some time during the week that you could use to make some money. If you don’t have a part-time now, I highly recommend getting one. An on-campus job is ideal, as they’re usually easy to get to and flexible with your class schedule. You might even be able to find one that lets you do homework on the job. Move off-campus next year. While I think it’s a great idea to live in on-campus dorms for the first year of school, you might want to think about bailing once you’re a sophomore. For the most part, living on campus is quite a bit more expensive than finding an off-campus apartment – especially if you’re forced to have a meal plan. Cut your own small expenses. If your parents can skip their daily latte and stash the savings, so can you. You can also choose not to go out to the bars every weekend, or at least sneak in a flask. Build a personal brand. This tip was originally going to be “Find a high-paying summer internship”, but I’m sure that’s already one of your goals. If you want to do that, you need to start learning how to build a personal brand and promote your skills. Make paying off debt your #1 priority. Don’t buy a house. Don’t get a nice car. Live like you did in college, no matter where you are, and focus on taking everything you make from your new job and throwing it at your debt. This was exactly my strategy – I finally started making a good amount of money, and I immediately started throwing as much of it as possible at my debt. Take a second job for a while, or do freelance work. You might be working from 9 to 5 now, but you’ve still got 5 to 9 free. Take the temporary hit to your social life and find a second source of income that you can dedicate 100% to your debt. Once you’ve paid it all off, you can quit the second job and revel in the bliss of being debt-free. I’ve shared my story, and provided some strategies for staying out of debt. Now, it’s simply up to you to take action. If you have student debt – whether it’s $100,000 or just $500 – start taking steps today to pay it off. This is so important. You don’t know how amazing it feels to be debt-free until you’re actually there. But I know you can do it. Get started. P.S. – A few people have called my story “unrealistic” and not relevant to the average student. While I realize that it’s not common, I absolutely will not back down from my belief that it’s possible to pay off your debt much faster than normal if you’re focused and driven. To those who still aren’t convinced, read the story of Brian McBride – a guy who paid off over $26,000 in just two years while making only $25 an hour. Did this post inspire or help you with your own debt-obliteration journey? If so, please share it with a friend who could benefit from it as well. It’s my goal to help every college student get out of debt, so every bit of sharing helps. Thank you! If you’re interested in learning more about how to pay off your debt, and be awesome at college in general, sign up for my newsletter using the orange box below. In addition to updates about my best new content (and no spam ever), you’ll also get access to exclusive resources to help you learn to promote yourself and your skills to recruiters!